MOSCOW, September 27. /TASS/. Head of Russia’s Roscosmos State Space Corporation Dmitry Rogozin has discussed the prospects for Russian-Chinese space cooperation with Chairman of the Chinese People's Political Consultative Conference Wang Yang, as he himself said on Facebook. "I have discussed promising areas of space cooperation with Wang Yang, a permanent member of the Standing Committee of the Central Political Bureau of the Communist Party of China and the Chairman of the Chinese People's Political Consultative Conference," Rogozin wrote without going into detail. 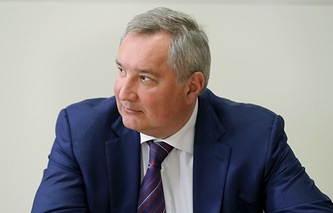 The Roscosmos head is expected to hold through talks on space cooperation in Beijing on Friday, the corporation’s press service told TASS, adding that on Thursday, Rogozin had visited the China Association for Science and Technology. While on a visit to the Indian capital of New Delhi earlier, Rogozin discussed space cooperation with the Indian prime minister’s National Security Adviser Ajit Kumar Doval. The Roscosmos chief offered long-term partnership in manned space missions to India as a BRICS member. According to Rogozin, it would help facilitate the training of Indian astronauts for joint missions on the moon. Rogozhin also suggested that the first Indian astronauts be sent to the International Space Station. Roscosmos sources said later that India had shown interest in the initiative.